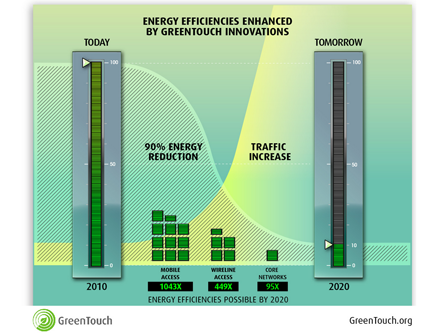 The GreenTouch industry consortium says new technologies could cut power consumption by 90 percent. Networks could use far less energy by 2020 even though they’ll be carrying much more traffic, an industry group says. “There is potential with these new technologies to support the traffic growth and still make the energy consumption go down,” said Thierry Klein, chairman of GreenTouch’s technical committee. Klein also leads green research at Alcatel-Lucent’s Bell Labs division. The tools that make this possible include new devices, components, algorithms, architectures and protocols, Klein said. All have been proved in labs, he said. The potential energy savings represents a comparison between a 2010 network with that year’s traffic levels and a theoretical 2020 network with projections of traffic amounts for that year. “If you were to use all of those things together, this is the overall potential,” Klein said. GreenTouch is working on other technologies that could drive even greater efficiency but weren’t proven enough to include in the report, he said. GreenTouch won’t ship any products itself, but rather is helping to bring carriers and vendors together to find ways to reduce power consumption. 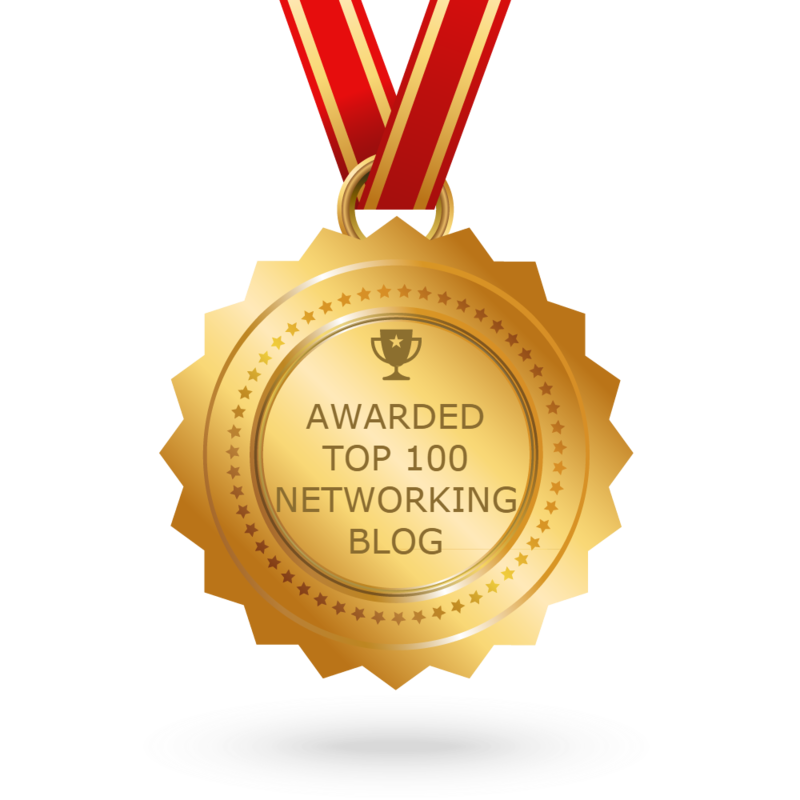 When Alcatel-Lucent announced the formation of the group, it had 10 members, and that list has since grown to 50, including Huawei Technologies, Fujitsu, Samsung, Vodafone, China Mobile and numerous universities. However, some of the biggest names in carrier networking, including Ericsson, Cisco Systems and Nokia Siemens Networks, aren’t part of GreenTouch. Their absence could represent a missed opportunity for even more progress on green networks, according to Saverio Romeo, an analyst at Frost & Sullivan. GreenTouch’s findings are promising and could become real, but there are too many different green-network initiatives in play today, Romeo said. Broader efforts under standards bodies such as the International Telecommunication Union (ITU) or Institute of Electrical and Electronics Engineers (IEEE) could lead to even more power gains, he said. “We are missing out on even greater efficiency … if there is a lack of cooperation between these various activities,” Romeo said. GreenTouch’s Klein also believes carriers will want to invest in the new technologies, even though most of the features will require new equipment. “A dollar spent on energy is a dollar wasted today,” Klein said. If network gear doesn’t change, it will take much more energy to carry the amount of traffic users will produce by 2020, GreenTouch says. The conclusions of its study are based on forecasts that the amount of traffic on wireless networks will have multiplied by 88 times between 2010 and 2020, while wired access networks will grow about 10 times more busy and wired core networks will see traffic multiply by eight times. One problem with current networks is that most of them are always on, even when not needed. “For the most part, the energy consumption of the equipment is at the peak power, or very close to the peak power … even when there is no load,” Klein said. “Even at the subsecond level, I can turn some of the equipment on and off very fast, and I save energy when I don’t need all the bandwidth to handle the traffic,” Klein said. Wireless networks are the least efficient, according to GreenTouch. The technologies it has already identified could cut wireless networks’ power consumption by 1,043 times, the group said. Shifting traffic from macro cells on towers to small cells indoors or at street level is one way to do this. However, that could leave even more pieces of equipment up and running without any traffic at some hours. The Lego-block approach, applied to wireless, could power down individual small cells or even change the power level of an antenna as needed, he said. Wired access networks could be made 449 times more efficient and core networks could see a 95x gain by 2020, the group said. The optical technology that’s widely used in wireline networks makes them more efficient than wireless already. Other technologies that could help to drive efficiency in the next seven years are Bi-PON (bit-interleaved passive optical networks), content caching and separation of the control and data planes of the network, according to GreenTouch. About the author: Stephen Lawson covers mobile, storage and networking technologies for The IDG News Service. Follow Stephen on Twitter at @sdlawsonmedia.